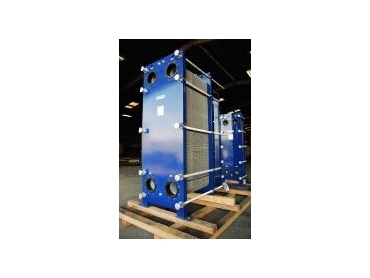 The AT80 plate heat exchanger. TERALBA Industries , manufacturer of Mueller Accu-Therm plate heat exchangers under licence from USA-based Paul Mueller Company, has released a new plate heat exchanger, the AT80. The Mueller Accu-Therm AT80 is especially designed for applications where substantial heat transfer is required with close temperature approaches and high flow rates. The AT80 is available with 200mm connections, making it suitable for flow rates of 400m3/hr, in a single pass design. This minimises the installation and capital costs which are usually incurred when manifolding two smaller plate heat exchangers to achieve the same duty. Teralba Industries now stocks significant quantities of the USA-sourced AT80 heat transfer plates, as well as Australian-made AT80 frames, thus minimising lead times. As Teralba manufactures the frames a wide variety of connections is available to suit hygienic and industrial applications. The AT80 is available with 316 stainless steel and titanium gasketed heat transfer plates.